(a) Table. The table is mounted on the column or base and is provided with T-slots for clamping the work directly on its face. The table may be round or rectangular in shape. 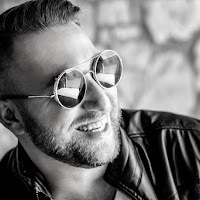 (b) Vice. 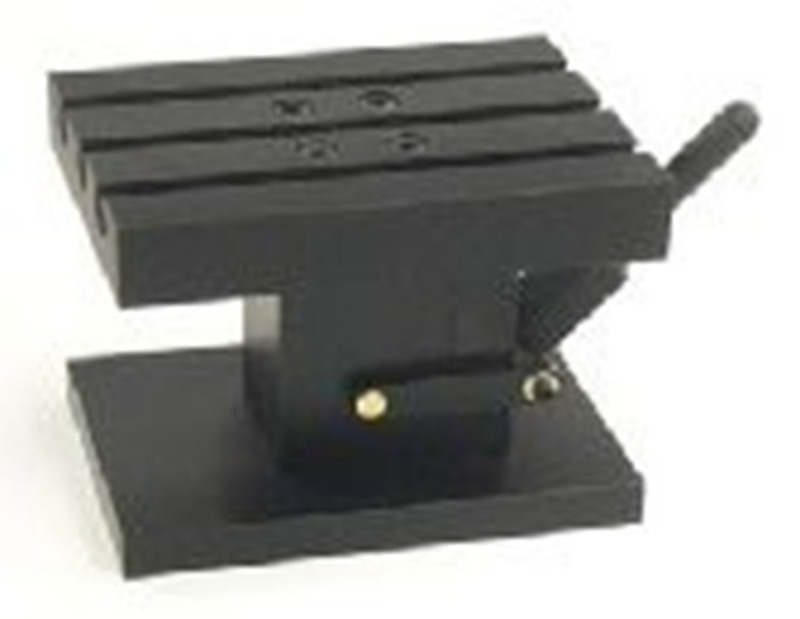 The drill press vice is one of the most common holding device for small and regular shaped work pieces. The work is clamped between a fixed jaw and movable jaw. 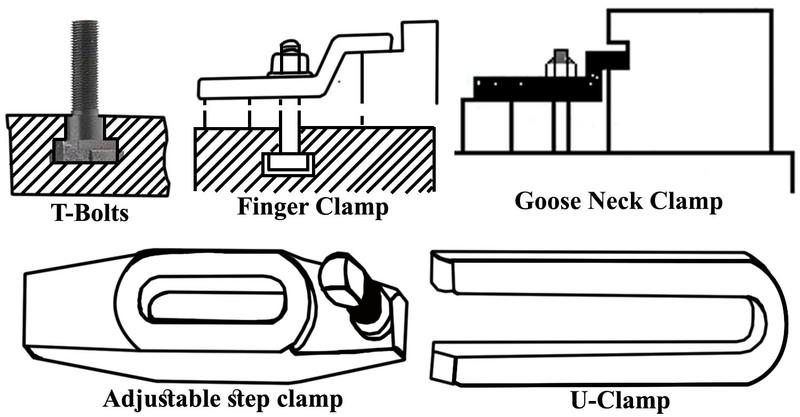 Extra slip jaws are supplied for holding cylindrical or hexagonal bars. The screw of the vice rotates in a fixed nut in the movable jaw. 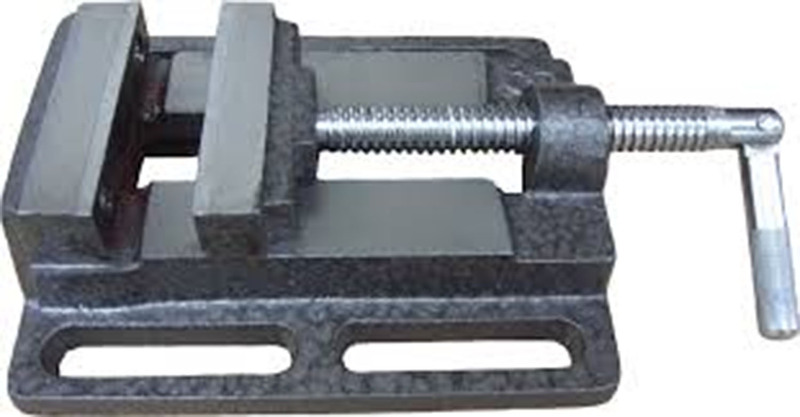 The screw of the vice may be square or buttress threaded. 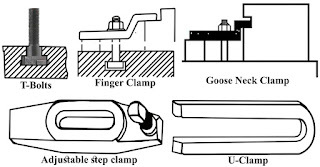 While clamping the work in the vice, parallel blocks are placed below the work so that the drill may completely pass through the work without damaging the vice table. The drill press vice may be Plain or Universal type. 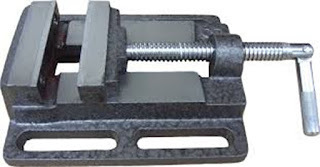 In a universal type vice the base may be swiveled at any angle about the vertical axis and it may be tilted in a vertical plane to drill holes at an angle. (d) V-block. The V-blocks are used for holding round work pieces. The work may be supported on two or three blocks and clamped against them by straps and bolts. V- blocks are accurately machined cast iron or steel blocks. (e) Angle Plates. The angle plates are usually made of cast iron having two faces at right angles to each other. The faces are accurately finished and are provided with holes and slots for clamping the work on one of its face while the other rests upon the table and are bolted to it. Angle plates are used when it is necessary to drill a hole parallel to another surface. (f) Drill Jigs. The drill jigs are used for holding the work in a mass production process. A jig can hold the work securely, locate the work and guide the tool at any desired position. The work may be clamped and unclamped quickly. Jigs are specially designed for each type of work where quantity production desired. Holes may be drilled at the same relative positions on each of the identical work pieces without marking the work individually. The work is clamped below the jig and the holes are located. The drill is guided by the bushing, and when the work is completed, the second work is clamped below the jig and the process is repeated.